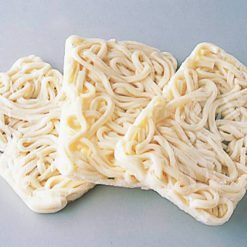 High quality, springy udon noodles made from 100% wheat flour. Simply boil, drain, and enjoy. Package is 600g total (200g x 3 servings) and arrives frozen. These udon noodles have a delightfully springy texture. 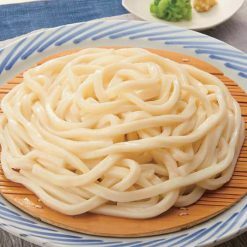 This is because: ① Compared with ordinary udon noodles made for freezing and boiling, these udon noodles have a higher quantity of added water (they have about 50% added water; ordinary udon noodles often have about 40%). ② They are made using wheat from Australia and Kyushu, at a ratio of 2:1. The water used to make the noodles is underground water from the source of the Nishiki River in the northern part of Yamaguchi Prefecture, a place surrounded by plentiful water and greenery. The ratio of Australia/Kyushu flour was decided after taking its compatibility with the water into consideration. Because our company takes the time to let the udon noodles ‘rest’ during production, we are able to thoroughly draw out the gluten of the wheat. This is one of our steps to take the noodles’ pleasant elasticity and create a delightfully springy texture. Remove the udon (still frozen) from its bag, and place it in boiling water. Boil for 1 minute to 1 minute 30 seconds. 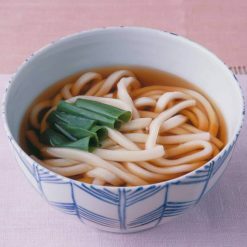 Drain the noodles and transfer them to a bowl, then serve with udon tsuyu or other ingredients.Some of the most popular dishes that use udon are kitsune udon (“fox udon,” udon noodles in soup with fried tofu skin on top), tanuki udon (“raccoon dog udon,” udon noodles in soup with small pieces of fried tempura batter on top), and zaru udon (chilled udon noodles, eaten without soup and with a dipping sauce). This product contains wheat flour (Australia, Kyushu), table salt (domestic). This product is not suitable for anyone with allergies to wheat or contamination.